Saturday 11/17/18– Goal Race. Boys 4th, gals 7th. Great season, I love you all, the end. Race Last Meal Warmup To the Line Race. Wednesday 11/14/18-50m on grass loop. Tuesday 11/13/18-lower leg drills, 15:00 up, SDS (8) 8*200 in 30/ 35, 2 laps down. Stretch after. Monday 11/12/18-lower leg drills followed by 1.5 to Lewis Chamberlain Park, guys ran 5 miles, gals 4, on 800m loop. 1.6 miles back to school. 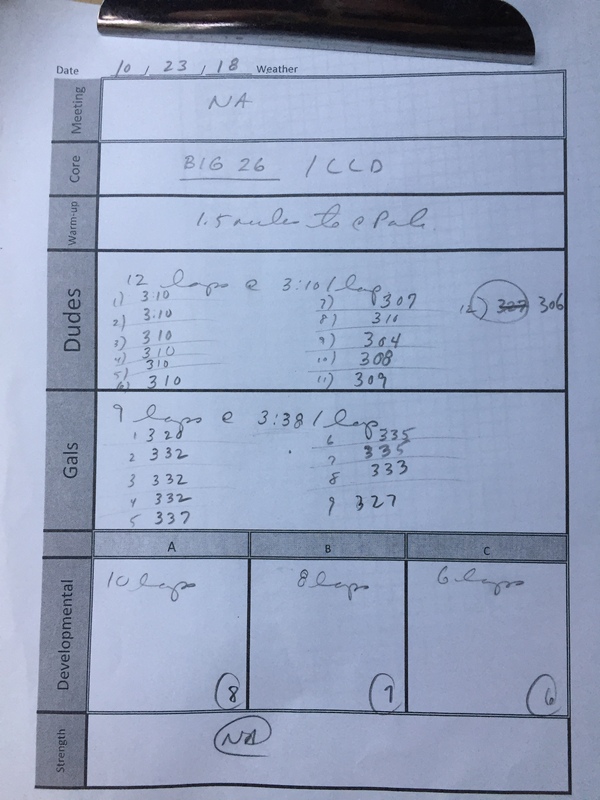 Tuesday 11/6/18-BIG 15s followed by lower leg drills, 15:00 up, SDS (8) followed by 800 at faster than goal 5k, short rest, 3200m at LT, 400m at a good clip. Guys went 2:18- 2:25, 30s rest, 3200 at 10:30-10:49, 30 s rest 400 in 62-68, gals went 2:47- 2:50, 12:33, 70-75, 5-10 min. Boys ran 5.5 miles or so, gals ran 4.5 miles plus. Saturday 11/3/18-Boys win ! gals 2nd! 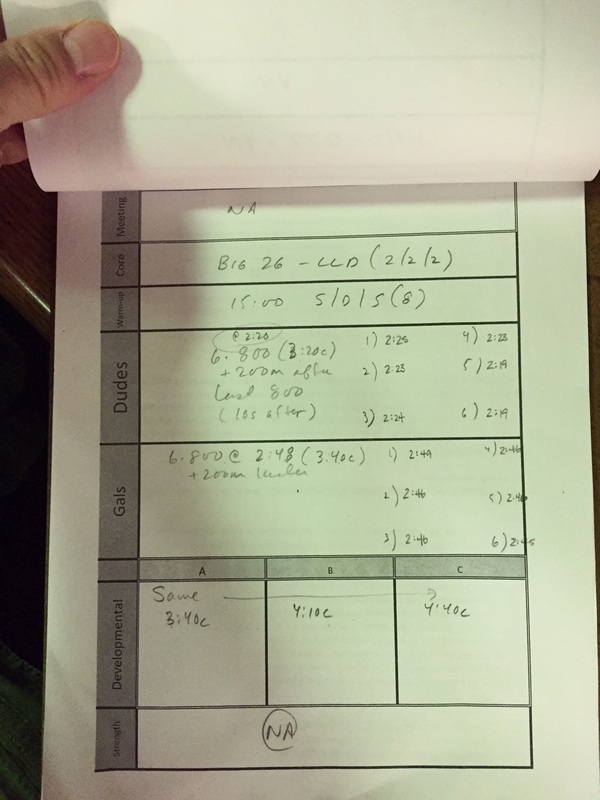 Friday 11/2/18– visualization, meeting, 30:00, x 4 x 100m. Wednesday 10/31/18– JV state champs!!! Boys finished 3rd among top teams in the state!!!! Great job!!!! Varsity performed BIG 10s, Lower leg drills, ran to 1.6 to LCP, boys ran 5 miles at 6:10/ mi, 1.5 mi home, girls ran 4 miles at 7:10/ mi. Tuesday 10/30/18-those competing at the JV champs performed their re meet assignment. 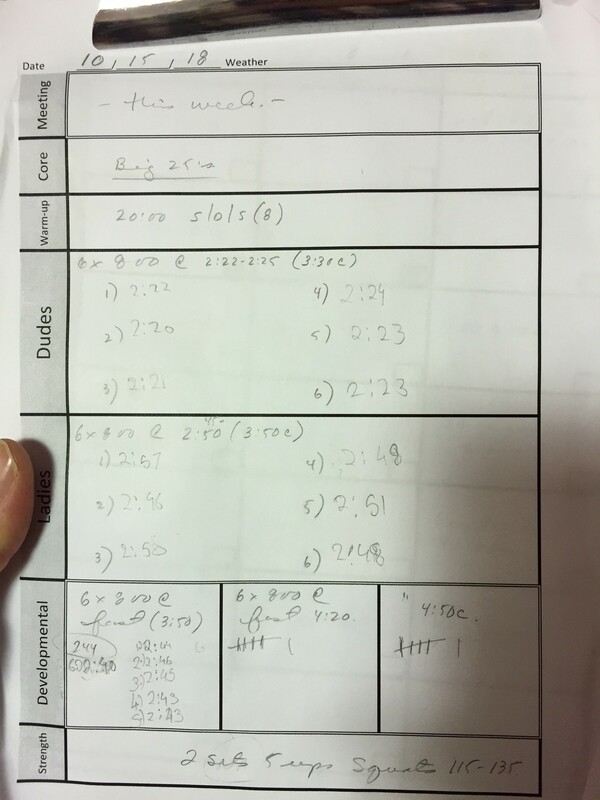 The varsity squad performed BIG 26s followed by lower leg drills and 1.6 miles up to LCP, 2 x 1 mile at LT, and 6 x 225m at faster than mile pace, 1.5 mi down. 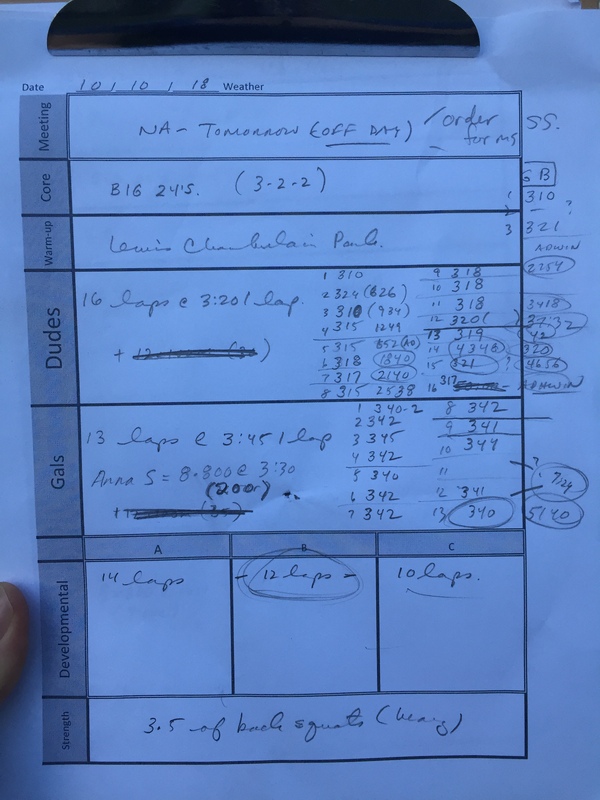 Monday 10/29/18-Bus to Thompson Park, gals ran the last 1.25 miles 7 times and finished with 10 x 100m, guys ran the last 1.25 9 times and finished with 10 x 100m, Developmental group ran 45 minutes on the last 1.25m of course followed by SDS (8) and 4x200m (150m rest jog) followed by 10:00 easy. Sunday 10/28/18-75m in soft surfaces. Saturday 10/27/18-BIG 10s followed by lower leg drills and 30m up tempo on track in driving rain. Top gals and guys ran 2600m at goal 5k pace followed by 4 laps easy and 8 x 300m at faster than goal 3200 pace (100m walk rest)- 2 laps down, heavy squat followed by one lap easy. Wednesday 10/24/18-BIG 26’s followed by lower leg drills, 1.6 miles to LCP, 6 x 800m with a 200m kicker followed by 1.5 miles down. Details below. Tuesday 10/23/18– BIG 26s!!! (highest ever!!!!!!) followed by lower leg drills and a 1.5 mile run to LCP, steady 3-6 miles on grass 800m loop, 1.5 miles back for 6-9 on the day. top dudes and gals 4 x 1 mile at LT with short 90s focus break. guys avg’d 5:21, gals 6:20 or so. 10m cooldown followed by 3 sets of 5 reps squat . developmental groups ran 8 x 800m at LT pace, 2 laps down. Cheat Sheets for Mercer Co Champs!!! Sunday 10/21/18– 60 minutes and strides. 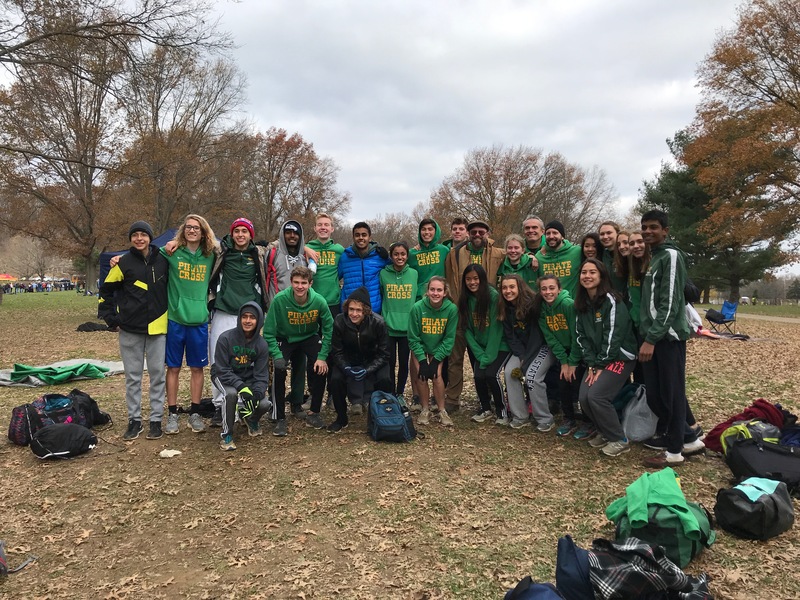 Saturday 10/20/18– JV boys and gals win counties!!!! Varsity athletes ran 11.5-13.5 miles followed by 10 x 100m. Friday 10/19/18-Boys and gals win counties!!!!! Thursday 10/18/18– lower leg drills followed by light run. Wednesday 10/17/18– Lower leg drills followed by a light run and a few strides for top groups, those racing Saturday ran 1.5 miles to LCP and 10 x 200m on grass with full rest, 1.5 miles back. Tuesday 10/16/18– BIG 25s followed by lower leg drills and 6-8 miles on grass and 10 x 100m barefoot. Monday 10/15/18– BIG 25s!!!!! followed by lower leg drills. 20 minutes up, SDS (8) everyone did a version of the following workout 6 x 800m on a short cycle followed by a quick rest and 200m sprint. 2 laps down and quick squat routine followed by an additional 1 lap jog. 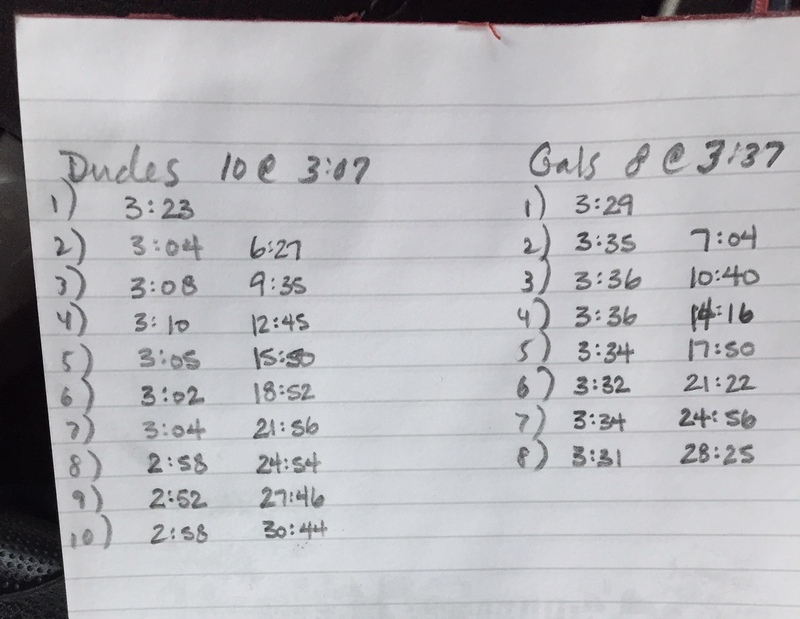 Thursday 10/7/18- BIG 23s, lower leg drills those not competing Saturday ran 12-16x 400m on a short cycle, standard warmup and cooldown. Tuesday 10/2/18- 5k race, varsity held back. Monday 10/1/18- mileage and strides.